The stage is set in Guadalajara for a destination hotel unlike any other. Hard Rock Hotel is coming soon and bringing with it, VIP experiences like our Body Rock® Fitness Center, relaxing Rock Spa®, legendary Rock Shop® and an infinity sky pool on the top of the hotel. Events will be an epic experience, with more than 7,000 square meters of edgy space inside the hotel and out in the fresh air. In partnership with Iconia Cubos, the hotel will also offer an exclusive dining destination, the Gourmet Center, as well as 12 movie theaters. 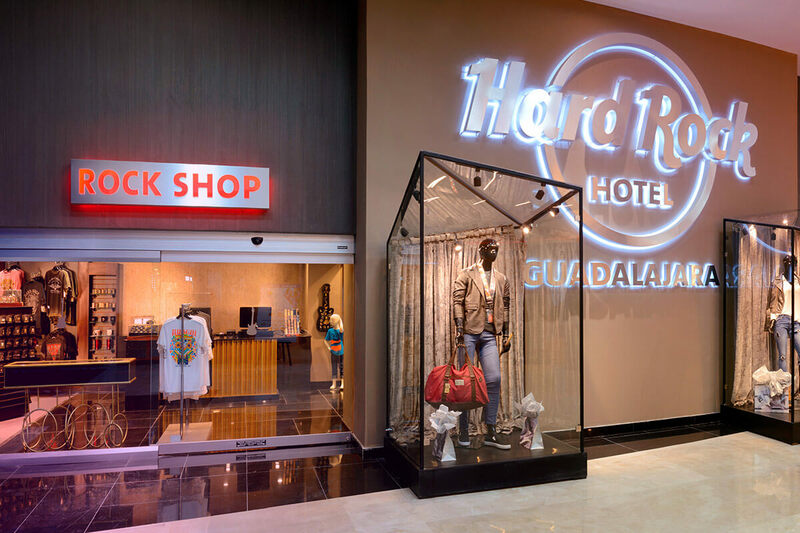 Hard Rock Hotel Guadalajara will be Western Mexico’s premier place to live it up. Exclusive retail-therapy and sleek bars. Sunshine segues into nightlife. Spa strips away stress and room service rocks around the clock. At Hard Rock Hotel Guadalajara , we perform at every level, especially with our food and beverage offerings. You’ll find some bars and dining options inside the hotel to choose from. So, bring your appetite. We’ll deliver the rest. SESSIONS: An authentic fine-dining experience. UTC – 6 Lobby Bar to unplug for a while in a place with live music and your favorite drinks. CONSTANT GRIND: Coffee bar to regain your edge with some high-octane caffeine. B.I.T.S. – rooftop lounge on the 30th floor. After living it up in Guadalajara, come wind down in one of 348 rooms and suites, welcoming guests with our signature contemporary style and chic vibe. You’ll sleep like a baby with plush bedding, luxury amenities, and some digital features to make resting even easier. All of Hard Rock Hotel Guadalajara. Hard Rock Hotel Guadalajara can fill any bill. Seven rock star meeting rooms with an artistic vibe and outdoor terrace are ready to exceed your expectations. Whether it’s a corporate meeting or the social event of the year that you’re planning, our venues bring you a perfect match between comfort, technology, and music. Be a Hard Rock Rewards member and get the Rock Star perks. Earn awesome rewards at participating Hard Rock Hotels, Hard Rock Cafes, Rock Shops, Rock Spas and restaurants by Hard Rock.